I just recently re-read one of my favorite books from when I was in college. It’s a book entitled “My Sergei” by figure skater Ekaterina “Katia” Gordeeva, about her husband & skating partner, Sergei Grinkov, who passed away unexpectedly at a very young age. This book introduced me to a more intimate look at family life in Russia in the seventies and eighties, as Katia wrote extensively about her childhood in the Soviet Union – the trips to their dacha to hunt mushrooms, the dishes that her babushka would make for holidays, the celebrations of certain festivals, like New Year’s Eve, which apparently was the biggest holiday of the year for Russians. For this New Year’s Eve, Jules and I didn’t make any big plans. We said we were just going to have a big bottle of champagne and maybe some caviar (a “grande bouffe” of sorts). 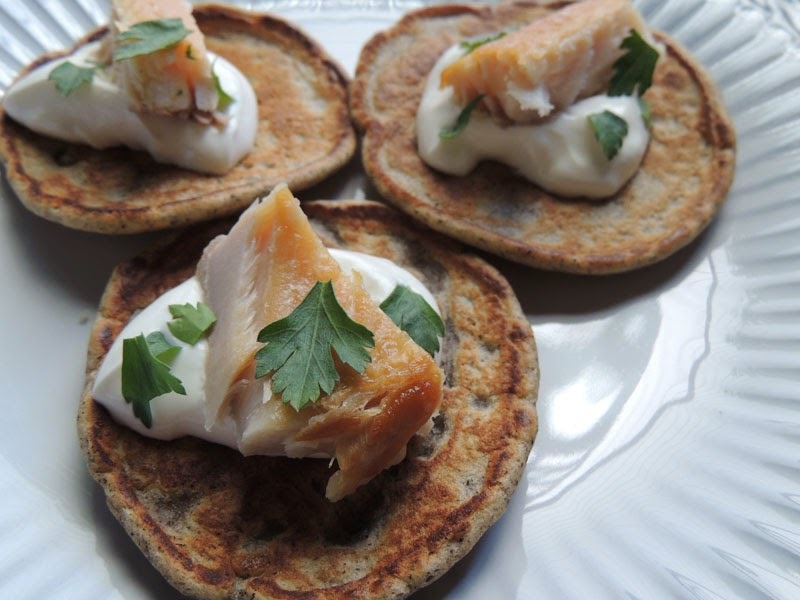 Of course, I couldn’t help myself and I started researching menus that included champagne and caviar, and ended up preparing a Russian-themed feast of golubtsy, blini, caviar, smoked fish, pickles, and mushrooms in sour cream. (Jules also wanted steak, so we prepared a small ribeye to share.) Of course, we accompanied everything with vodka and eventually champagne! 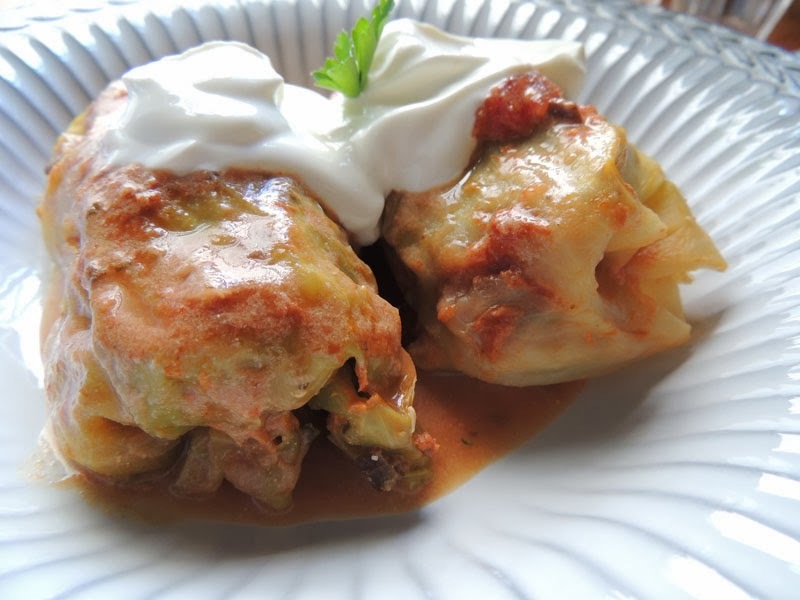 Here are two of my favorite recipes from this evening’s menu, cabbage rolls stuffed with meat and rice, and buckwheat pancakes that can be topped with virtually anything. In a food processor, combine all of the ingredients except the seltzer and canola oil and puree until smooth. Scrape the batter into a large bowl and let stand for 15 minutes. Whisk 1/3 cup of the seltzer into the batter; it should have the consistency of pancake batter; add a bit more seltzer if the batter is too thick. Heat a large nonstick skillet or griddle over moderate heat until very hot. Brush with oil. Spoon tablespoon-size mounds of batter into the hot skillet and cook until bubbles form on the surface and the blini are browned on the bottom, about 1 minute. Flip the blini and cook for 30 seconds longer. Transfer the blini to a baking sheet. Brush the skillet with oil as needed and repeat with the remaining batter, layering the cooked blini on the baking sheet. Serve the blini warm or at room temperature. We serve ours two ways – either with sour cream & caviar, or sour cream and smoked fish. Jules’ favorite is smoked trout, but any smoked fish will do. 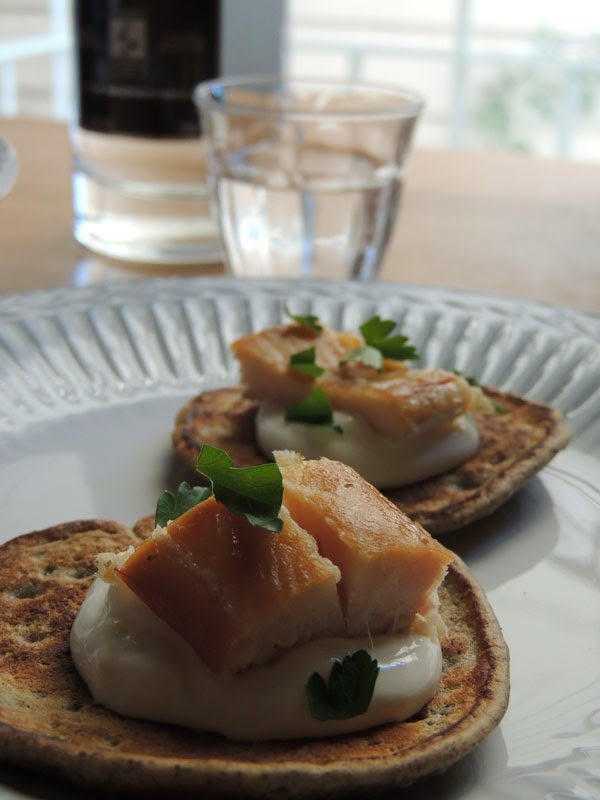 You can use a gravadlax style salmon too, which is really lovely. Top with chopped chives, scallions, or flat-leaf parsley for a bit of color. To make filling, heat clarified butter or oil in a frying pan over medium-low heat. Add the onion and fry until soft, about 7 minutes. Add carrots, and fry for another minute or so. Remove from heat, let cool. Place mixture in a bowl with meat, rice, eggs, and spices. Mix well to combine. At this point, you want to taste your mixture to make sure it’s seasoned enough – take a small spoonful and put on a plate, and microwave until it is cooked. Taste and season accordingly. Core cabbages and place whole in a large pot of boiling salted water (you will probably have to do this one head at a time). You should be able to begin pulling the cabbage leaves off by layers. Put into a colander to drain. Cut thick ribs from larger leaves, then halve the leaves; keep smaller leaves intact. You will need 14-16 leaves. Use leaves and trimmings to line a casserole pan or large dutch oven. To make the rolls, place a generous spoonful of meat filling at base of each leaf, roll one turn and tuck in sides to contain filling. Roll firmly to end of leaf. Arrange the rolls in a large pot, pour the spaghetti sauce over the top. Place in a oven for about 45-50 minutes. Serve the rolls hot or warm. Serve with yogurt or sour cream.